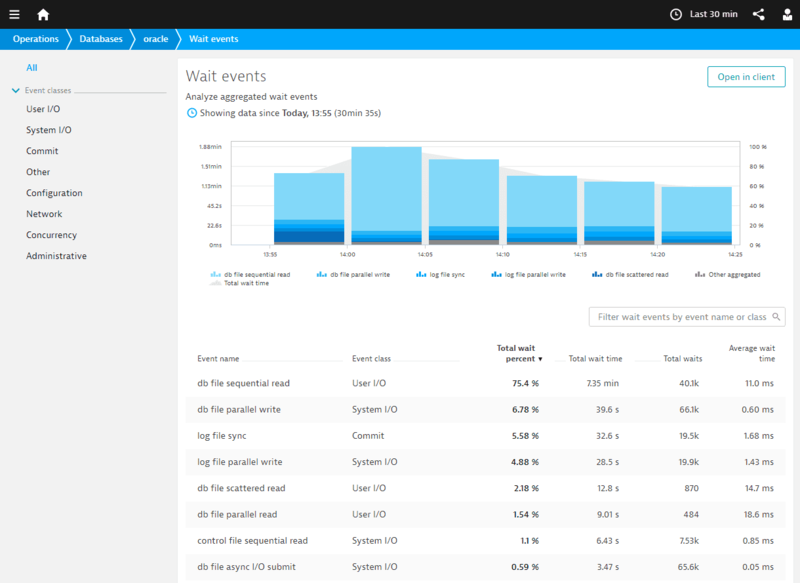 The Wait Events web view presents wait events with longest total wait time, aggregated over given timeframe. The goal is to characterize the current wait events distribution. Waits can be caused by number of actions related to database engine, like reading disk, resource locking, network access, internal database maintenance or other. The chart displays top five events that consumed most of wait time and additional series for all other events, aggregated. Series can be hidden on chart by clicking on it&apos;s name in chart legend. The table is initially sorted by the Total wait percent, aggregated for all invocations. You can sort the data by any column. A specific wait event may be found by filter in the upper right. Short wait events may appear in the table, if in aggregate they generate a large wait. In this case, they have low Average wait time and high Total waits. Oracle only Click the item in the left hand panel to filter events by class. Event name The name of the wait event, as returned by the database. Total wait percent Percent contribution of the wait event in all collected waits in current timefame. Please note that this is using sum of all collected waits. If there are more than 100 different events, least significant are ignored. This means the real percentage value might be slightly smaller. For precise value of global wait time, user the Total wait time measure of the Database Agent. All supported databases. Total wait time Overall wait time for all wait events with this name in the current timefame. Total waits Overall amount number of all wait events with this name in the current timefame. Average wait time Average time per single event with this name in the current timefame. Calculation is based on the Total wait time and Total waits of the event.